Please come to your dancers regularly scheduled class time and you can watch all of the choreography they have been learning for the recital! You may bring your cameras to take pictures and film if you would like! We’ll see you then! *Costumes will be sent home at this visitation, only if there is a parent/guardian present and if they are paid for in full. Tickets will go on sale Sunday, April 28 at 7:00 pm CST. You will be receiving an email with the link and your recital ticket codes the week tickets go on sale. All tickets must be purchased online. No tickets will be sold at the studio. Ticket price points will be $6 and $10 and you will be able to select the seats you want at the time of purchase, which means, no waiting in line outside to get your seats! Online ticket sales will end May 22 at 7:00 pm CST and will then be $10 at the door. 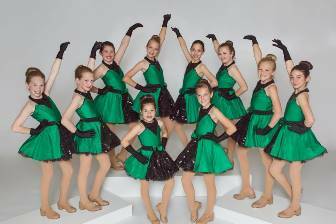 Come to class wearing your favorite dance recital costume! $2 to participate. No Dance Saturday, April 20 and Monday, April 22. Happy Easter! If you do not have the correct color or style of dance shoe, please see me or our office staff so we can place an order so that they are here in time for the recital!